Home automation has been a dramatic theme of science fiction for ages, yet few realize that this sci-fi premise is a day-to-day reality for many people. While most people are content enough to rely on the time-tested light switch and power button, many have invested in home automation to provide greater access to existing lighting and appliances, enhance their living spaces with new and creative lighting options, and program their lighting and appliances to behave according to a number of sensor triggers. There are many ways to get to an automated home, but one avenue involves replacing standard incandescent, CFL or LED bulbs with bulbs that have an integrated radio. Philips Hue probably leads this market share, but other contenders include LEDVANCE Sylvania Lightify, Belkin WeMo, Ge Link and CREE Connected. I’ll be reviewing the LEDVANCE Sylvania Lightify Bulb, Smart Hub and RGBW flexible light strip over the next few weeks. I’ve researched how easy they are to set up, how they look, and how they integrate with other automation hubs. But first, let’s look at the LEDVANCE Sylvania Lightify Bulb. Read on to see what I think. The LEDVANCE products belong to a class of home automation based on the ZigBee wireless protocol. This is a radio based protocol that operates on 915 MHz in the US or 2.4 GHz worldwide. The range of each ZigBee device may vary between 10 and 100 m, line-of-sight. That may be sufficient for most cases, but if extra range is required each Zigbee device operates as a transceiver to extend the range of other connected devices in what is called a mesh architecture; each device is capable of relaying data for other devices on the same ZigBee network. One node of this network is an interface hub. The Hub interfaces with an external network to provide manual operation, obtain programming, and enable automation with other systems. The Zigbee protocol is an international standard so there is some interoperability within devices, but the way each hub interfaces with its controlling application or the internet depends on the manufacturer’s implementation. Therefore, while LEDVANCE bulbs may work on a WeMo, Hue, or SmartThings hub, don’t expect the LEDVANCE Hub to be controlled by the WeMo, Hue or SmartThings application. Because of the way these interfaces work, I’ll review the bulb separately from the Hub or controlling application. 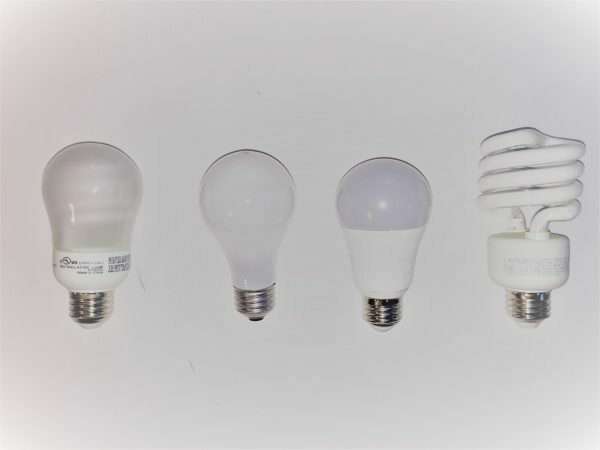 From the pictures below you can see that the LEDVANCE Sylvania Lightify A19 bulb, pictured second to the right, looks very similar to a standard incandescent bulb. The bulb is a bit heavier than a non-ZigBee enabled LED bulb (140 g vs. 81 g) but very rarely does the weight of a bulb factor in to its use. 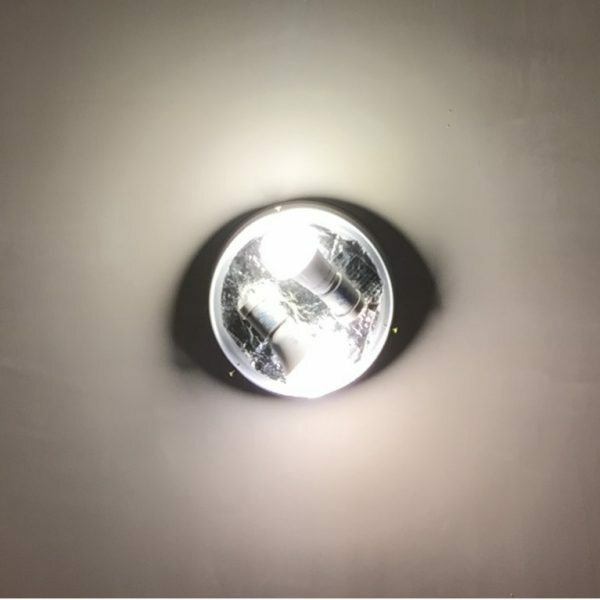 The bulb is rated for operation in damp environments (no direct exposure to rain, snow or excessive moisture) but not rated to be used in totally enclosed luminaires (ones that prevent the heat generated by the LED driver to dissipate effectively). The LEDVANCE bulb is an A19 shaped bulb that has a nominal white light output of 800 lumens. This means that when it is set to shine with 2700K color temperature light at 100% output it produces approximately the same amount of light to an old-school 60 W bulb. Obtaining reliable and meaningful light output measurements is very difficult and requires expensive instruments to do correctly. 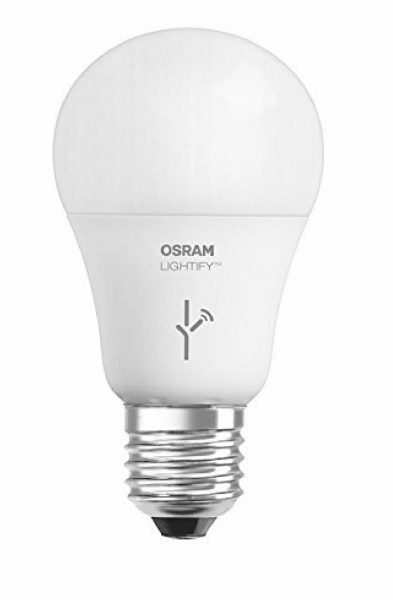 As an alternative, I have a light fixture that takes two bulbs in my house and I can use this to compare the Lightify bulb to the brightness and color to other bulbs I have in my house. All of the bulbs used are rated for 800 lumens and 2700K and each picture was taken after about 10 minutes of being on so that all bulbs were hot. 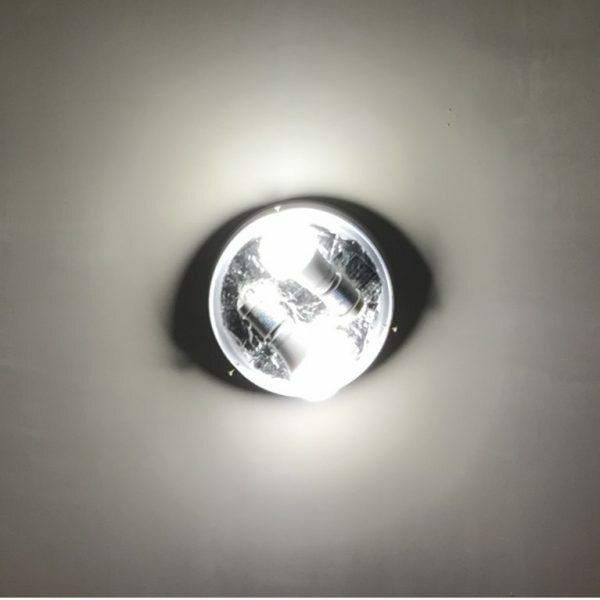 The first photo is two LED bulbs made by TCP. This photo is a “control” photo that shows the expected results with two bulbs that have the same color and brightness. Also, this room is in the process of being remodeled, so the ceiling is actually an unpainted skim coat of finishing compound. It’s not as reflective as a painted surface so the actual installed brightness may be improved when using in a finished room. The photos were all taken in an otherwise darkened room at night. The next photo shows the LEDVANCE bulb on the bottom and the TCP bulb on top. From the picture, you can see that the LEDVANCE color is a little pinker than the TCP bulb but about the same brightness. The next photo shows the LEDVANCE bulb on the bottom and a Greenlite CFL on top. From the picture, you can see that the LEDVANCE color is a little pinker than the Greenlite bulb but about the same brightness. 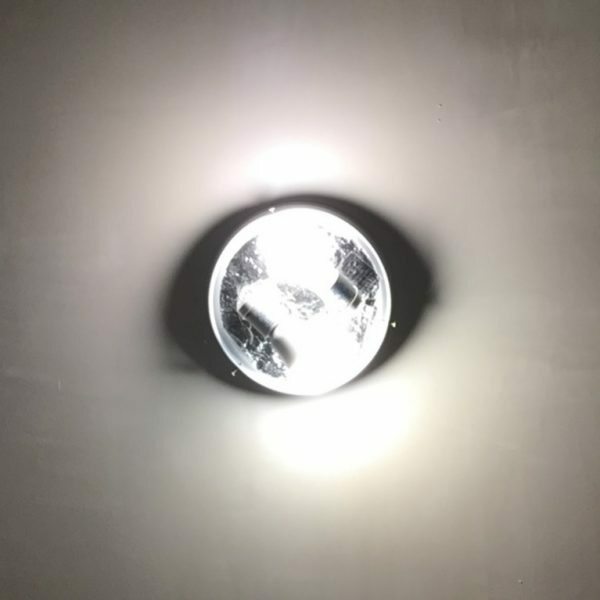 This photo shows the LEDVANCE bulb on the bottom and a GE incandescent bulb on top. From the picture, you can see that the incandescent color is a little pinker than the LEDVANCE bulb and the LEDVANCE bulb is brighter. The color differences in these photos were difficult to perceive with the naked eye when viewing these bulbs and the light that they generated off of the adjacent wall. For the purposes of this review, it seems that the nominal brightness and color of the Lightify bulb are as stated. the operation of the bulb from a wall switch is fast but lags behind an incandescent bulb and a standard LED by about half a second. I counted frames on videos to determine the lag time but I’m not posting the videos because we’ve all seen lights turn on before. Also, if the bulb is energized and is not bound to a network then it will display the blue red green and white LEDs before operating at the 2700K, 800 lumen white light setting. The following video illustrates some of the bulb brightness, color temperature, and color palette achievable by changing settings on the LEDVANCE app. In conclusion, the LEDVANCE Sylvania Lightify LED smart connected light seems to be capable of the full range of brightness, color temperature and color palette as described. Binding the bulb to the LEDVANCE Sylvania Lightify Gateway was easy and because it is a ZigBee bulb it is capable of being operated by other hubs such as the Wink, WeMo and SmartThings hubs. The bulb costs as much as the Philips hue ($49.99) and on paper performs identically. However, I imagine that there are some minor variations between Hue and Lightify color palettes so I would stick with either one manufacturer or the other. Source: The sample for this review was provided by LEDVANCE. Please visit their site for more info and Amazon to order. What an amazing piece of lighting technology … would love to try one of these in my home! The trick is to pair it to the best hub for your situation. I’ll be looking at hubs in the near future.